Whether you’re new to sales or have at least one year’s experience in selling, this book will leapfrog your selling skills and understanding of sales techniques to a more sophisticated, satisfying and more genuinely customer and client-oriented level. If you’re more experienced, then this book provides a comprehensive refresher which uses fresh insights, the latest ideas and practical useable tools like checklists to help you sell more and sell better. The psychology of selling a product or service; the sales pipeline and how to ensure it’s realistic; making an effective sales presentation; up-selling, cross-selling, cold-calling and warm calling; effective approaches to prospective customers and clients; how to interrogate a database of contacts to get more sales; how to write effective sales materials; the power of business networking; how to get senior level appointments in your diary and closing a sale and follow up. This book will help you improve your sales performance by learning how to listen to your customer and client and collaborate with them profitably. Sales skills are certainly useful in almost every walk of life. In the current economic climate, the people who are doing well are the ones who are at the top of their game on the sales front. The Guru range of books is all about going back to basics and perfecting the important basic skills as well as refining tried and tested techniques so that you can stay one step ahead of the crowd. There are lots of fresh insights and practical, usable tools which will help you to sell more and better. Some very useful advice here. This is a great book. I have been selling in my retail business for more than 20 years and I know I can sell. But this book is a great refresher. It made me rethink and have a fresh look at the way I approach my work. 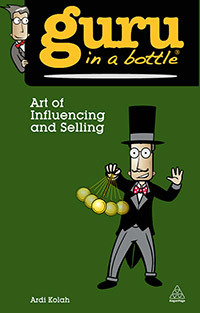 Excellent help for new sales recruits and old hands alike.